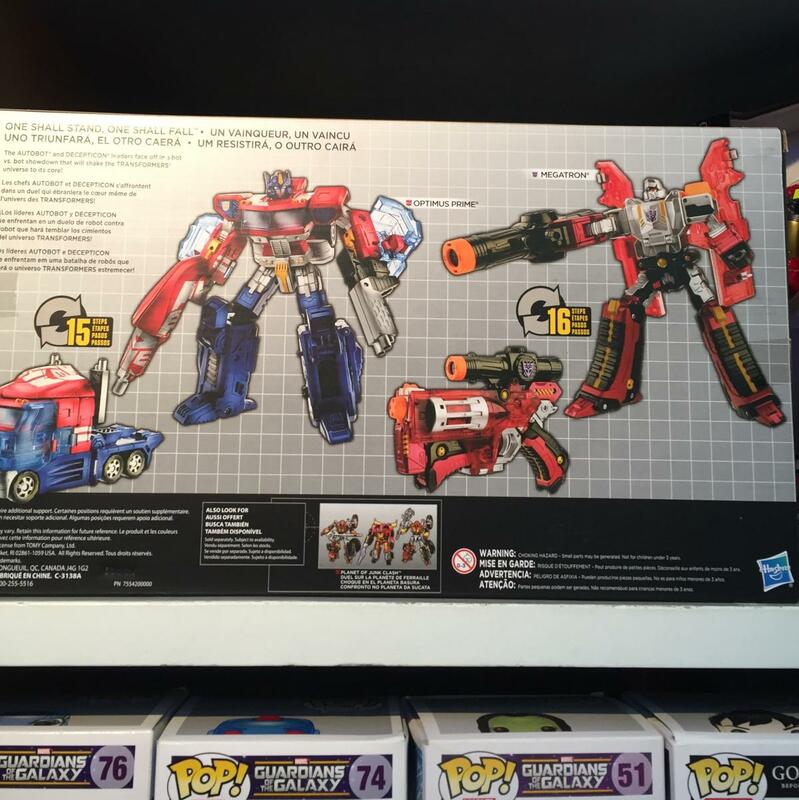 Via a post by Last Maximal on the Allspark, we have learned that the mysterious Classics Optimus Prime redeco we’ve seen in some auctions is in fact not only not a cancelled redeco but an upcoming release, and that it is coming in a Platinum Series two pack with a redeco of Voyager Classics Megatron! Yes, Hasbro has managed to bring back their Nerf gun Megatron for one more rodeo! The toys in the two pack are interesting redecos of the Classics Voyager molds. The Optimus Prime retains the traditional red and blue deco, but uses clear blue panels on the arms and has a huge Autobot symbol stamped on his wind vane. The blue arm panels make up the sides of the truck, and so gives the truck mode a bit of a disjointed feel, though the robot mode retains a coherent look. The Megatron is interesting. In robot mode, he has a silver body, with red forearms and red-and-black legs, which makes this the closest resemblance to a Generation 1 Megatron that Hasbro has done from this mold (though Takara’s Henkei and Legends releases still skew even closer to that nostalgia). The gun mode is mainly red, most likely to accede to the requirements to make toy guns look like toys and not guns. The bio on the set mentions “the leaders face off in a bot VS bot showdown that will shake the Transformers universe to its core”, and is named “One Shall Stand, One Shall Fall”, so it is meant to represent the scene from Transformers the Movie where Optimus Prime and Megatron had their final, fatal showdown. 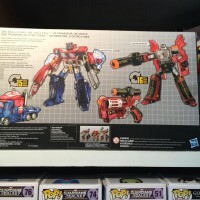 Like the Platinum series Planet of Junk Clash set we saw recently, this is another special edition set being made to coincide with and celebrate the 30th anniversary of Transformers the Movie. According to Last Maximal, this set is out in specialty stores in the Philippines. It remains to be seen if this set will make it to the USA, or if it will remain an Asian market / overseas exclusive. Prime lacks the red paint to separate his windows, making it look like one big window. I was not questioning your statement and I'm sorry if my reply came across like that. I was actually arguing against the sentiment that Hasbro couldn't release the sculpt again due to stricter regulations regarding toy weapons or something, because why would Megatron (whose alternate mode is based on a Nerf blaster) pose a problem when Nerf blasters are completely fine? I hope someone has a chance to ask a Hasbro rep about this mold seeing the light of day again during SDCC. I get that, but it's still been what, almost 10 years since that mold was released in the US? And all the other Classics molds have been used and re-used how many times since? If it's been fine this whole time to go back to with Nerf color schemes, it seems odd they wouldn't touch it at all. This Megatron is using a color scheme resembling that of the Toys"R"Us exclusive Nerf "Sonic Fire" subline imprint blasters. I keep saying that any color scheme Hasbro can use for Nerf without a problem should, by all intents and purposes, be fair game for Transformers as well. Hasbro touching that Nerf Megs mold again is notable, because they've never gone back to it since its original Classics release and no other vaguely gun-like things have been released as Transformers since then aside from a Legion Megs (that still had the orange tip) and a Legends Shockwave that is more a floating cannonish spaceship thing with a handle. This is very interesting that they're willing to bring this not just to North America, but the US specifically. That has to be at least some good news that Hasbro could 1. do a new gun-like Shockwave in Classics and 2. for those that wait on them, that Hasbro might someday bring over the Shockwave mold. Official Stock Photos from Hasbro's website. "Saw this a few weeks ago but failed to report it, therefore any potential news credit should belong to you". Jeez, does Hasbro hire monkeys to take their photos these days? I think you mean "munkys". That said, that Megatron looks awesome, and I love TFs with translucent plastic, but I already have Combiner Wars G1 Megatron. I don't have either of these molds and though Optimus' truck mode is kinda off his bot mode is on point. The lack of paint on Prime's clear pieces is inexcusable, and ruins the figure. Megs is cool. The Autobot logo on Prime's roof is reason enough for me to want this set, and I don't mind painting the arm pads. The fiery deco lends itself well to this Megatron. The Titans Return figures seem to have well-transformed stock photography. Ooh. Nice, I've wanted that Megatron since I saw him and I'm sure Prime will look fine in the upcoming Parallax armour. Same here. All my toy guns looked like replicas and we're die-cast. Exactly. People seem to get 'gun control' and 'replica control' mixed up here. I'm not going to go into what's better, as I'm sure my opinion is bound to anger some people, but I can assure you if its a replica all that the police will do is advise you to keep it indoors. Really? I double-checked and its not as strict as you'd think. Gun control laws, definitely (and thankfully). But its the fact that we don't generally own guns that allows toys to look a lot more real. I was referring to the original Walther P-38 deco. With an orange cap it'd be fine. EDIT: Not trying to start the whole gun debate. Just saying. anybody notice the set is up on ebay? one last set remains at this moment… I bought one just now… figured I have 3 of the lena primes (under 38 each back then), but one in box with a megs seemed worth it… now to find a loose megs. By "original" do you mean the first deco for Classics Megatron (orange nerf gun) or the original deco for G1 Megatron (all silver with little orange tip)?